In my other past work-life, when I worked with the World Bank, I partly dealt with this hocus-pocus called "HIPC". Completion Point, in principle is that you are considered have implemented initial measures outlined for the HIPC country to undertake - hence you are said to have reach a point where your creditors could BEGIN to consider "forgiving" some debt. 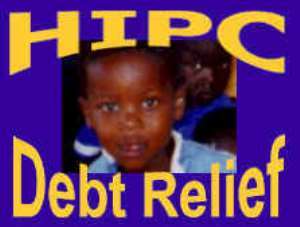 Actually what happens is that the creditors ask the HIPC country to use the debt payment it would have otherwise made to undertake poverty alleviation programmes back in the country. There have been a number of countries that have "reached completion point" in the past but how many got any debt write-offs worth talking about???. This HIPC idea/mechanism was largely muted by British with good intention, but has not panned out as intended. That is the truth. Look countrymen, as I write, Ghana only stands to be considered for an amount of about US$36m when the WB meets on Ghana's "completion point". The rest is all conjecture. Forget about all the hullabaloo of $100m per year that is being bandied about by Osafo Marfo. It isn't going to happen. It is a wish list of the Finance Minister of Ghana and his dreaming team. Won't happen. I speak on authority!! BUT OF COURSE IT MAKES THE NPP SLEEP BETTER HOPING THAT US$100M'S WILL BE COMING. OH WELLL…….